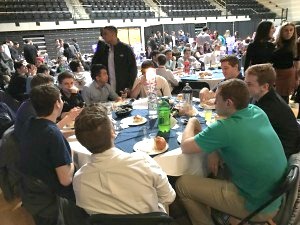 The National Hillel Basketball Tournament hosted its eighth annual Shabbat dinner Friday. 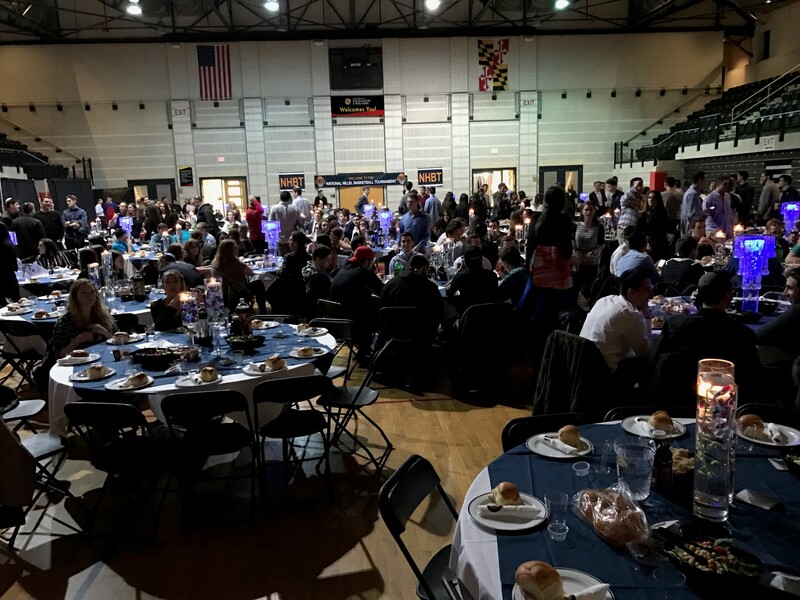 Over 700 Jewish students from around the country joined together in Ritchie Coliseum after sundown for a Shabbat dinner and service led by Maryland Hillel members and the NHBT planning team. Forty-eight schools are represented this weekend for the tournament and have brought 52 teams of men and women to participate in the basketball tournament. The dinner followed Shabbat services held at Hillel. Shoshi Wolf, the planning and events chair for the NHBT Shabbat dinner said the goal of this dinner was to take a break from the competition of the weekend and provide an environment where people with a common interest could come together to celebrate Shabbat. “We’ve been planning the tournament since September. This dinner has probably been in the works since October or November,” said Austin Horowitz, a junior economics major at this university on the NHBT planning team. He said the hardest part of the planning was finding a place to host such a large dinner, since this is the largest number of people that has ever signed up to participate in the tournament. The event began at 8 p.m., but attendees trickled in. Students mixed with old or new friends who were here for the tournament. There was a lot of time to socialize in the first hour while the planning team waited for all of the expected members to arrive. The food began to come out at 9 p.m.
Each table, though open to anyone, had a table captain; someone from this university who volunteered for the event. Multiple volunteers along with the entire NHBT planning team, made sure the night ran smoothly. “I thought this would be a fun way to connect with other kids from other Hillel’s at other schools,” said Gabby Antonelli, a sophomore business major table captain. After an alternative break trip with Hillel, she has gotten more involved with the organization. Students at this university who did not participate in the basketball portion of the weekend could pay a $10 fee to come to the Shabbat dinner. Amanda Haimm and Alexa Mayerhoff, two UMD freshmen, said they chose this route because they were not interested in playing basketball, but wanted to take advantage of the chance to celebrate Shabbat with their friends who go to other schools. Yeshiva University student Daniel Ferber said he chose to participate in the tournament, not only for the basketball or for Shabbat, but to see his friends he knows from home or from his gap year in Israel. He was looking forward to connecting with them in a new setting. This Shabbat provided a fun and casual environment to put the competition of the weekend on hold and allowed students from all over the country to make connections, Wolf said. The tournament will continue this weekend until one team takes the gold as the eighth NHBT winner. No Replies to "Shabbat dinner brings together old, new friends during NHBT"